The Australian National University will at long last have a swimming pool as part of a new, privately operated recreation building in Union Court, Vice-Chancellor Brian Schmidt says. The pool, scheduled to open in 2019, will be part of a new sport and recreation facility to be run by the Club Group, the Canberra-based operator of Club Lime gyms. It will feature a 15-metre-by-eight-metre hydro pool and a 24-hour, 7 day-a-week gym. The University held a competitive tender process to identify a preferred operator for the new pool and gym facility and selected Canberra-based leisure and facility owner and operator, the Club Group. The existing ANU gym, which will continue to operate, is run by the ANU Sport & Recreation Association (ANU Sport), an incorporated, not-for-profit organisation, and one of four organisations on campus that receive an annual allocation of Student Services and Amenities Fee contributed by students. Other sources of income include non-student member fees, facility usage charges and short courses. Professor Schmidt said a campus swimming pool had been one of the most requested items from staff and students for many years. “I think every one of my predecessors over the past couple of decades would tell you that the suggestion that ANU should have a swimming pool is one that is made often and repeatedly by everyone here, from first-year students to Professors who have been on the campus since before most of our students were born,” he said. The University plans to spend approximately $14 million to build a multipurpose recreation building that will include a 25m six-lane indoor pool. It is in discussions with the ACT Government about boosting the size of the pool to 50m. The ANU has more than 4,000 staff and 22,000 students, including 5,000 who live on the campus. “The residential community around us has also grown significantly in the past decade, and the demand for recreation facilities on our campus is far greater than what we can currently provide with a single gym and recreation centre,” Professor Schmidt said. 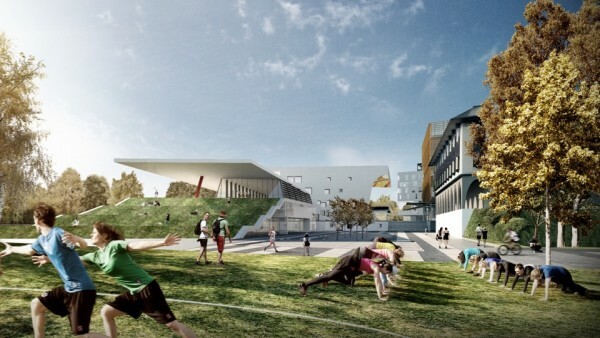 The pool and leisure facility was part of the $200 million stage one revitalisation of the Union Court precinct that would feature teaching and student buildings, a purpose-built event and theatre building, student accommodation, outdoor spaces and amphitheatre, bars, event pavilions, cafes, services, shops and underground parking. “This is part of the once-in-a-generation change to the heart of the ANU campus, Union Court, that will make life at ANU much more lively and fun, give us student and teaching facilities that are designed for the future of learning, and will open up our beautiful campus to the whole Canberra community as an events and leisure destination,” Professor Schmidt said. Great development – here’s hoping it will be priced so that students can afford to use it!